Introducing, Grogan’s Ridge Office Condominiums – another fine commercial office condominium project in the Spring area by SHB Development. Grogan’s Ridge will offer the same quality construction and amenities as its successful sister community, Forest Ridge Office Condominiums located near The Woodlands. Grogan’s Ridge Office Condominiums are unique in that they offer a complete package of benefits: The serenity of being surrounded by The Woodlands, the convenient access to I-45 and for professionals serving the energy industry, easy access to the new North Houston Exxon campus. Grogan’s Ridge is a community of professionals who want to take owning their own business a step further by owning commercial real estate. Many small businesses are finding office ownership to be a better alternative to leasing. For attorneys, accountants, real estate professionals, independent contractors, non-profit organizations or people currently working from home, Grogan’s Ridge is a perfect office solution. 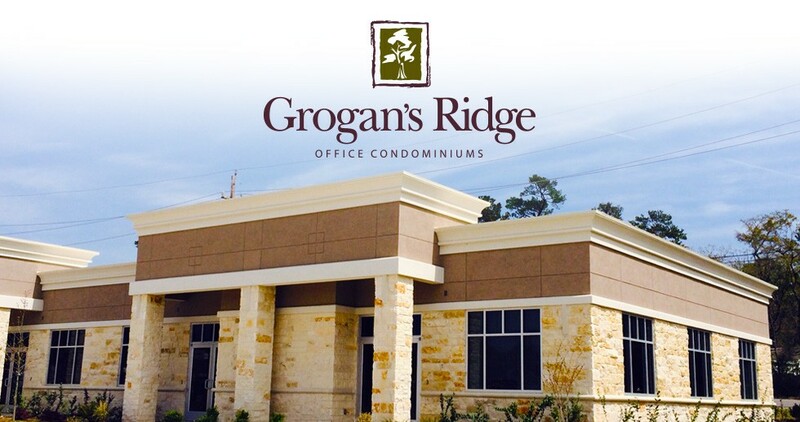 To learn more about the Grogan’s Ridge leasing program, click here or contact us today.